War and boom prompted an exodus from city to town | The Dacorum Heritage Trust Ltd. The rapid growth of London was seen to be a problem as early as 1927. The Second World War started in 1939, and in 1940 Lord Reith was appointed the Minister of Works and Buildings, responsible for studying methods for post-war reconstruction. In 1944, Professor Patrick Abercrombie published the Greater London Plan, the principal aim of which was to move one million people into newly created satellite towns around London. The New Towns Act, passed in 1946, provided for the establishment of a Development Corporation for each new town. They were to have powers to acquire sites large enough for a new town and to undertake all necessary developments, including houses, offices, shops, churches and hospitals. These new towns were designed to support populations of 60,000 with corresponding industrial development. Within the towns there were to be residential neighbourhoods of 5,000 to 10,000 inhabitants. Land between Redbourn and Hemel Hempstead was initially selected for this area as the only suitable site to the north-west of London. Abercrombie’s report did not see viability at Hemel Hempstead, as the valleys were narrow and much of the potential industrial land was inaccessible. However, both the County Council and the Mid-West Hertfordshire Joint Planning Committee preferred the planned expansion of existing communities rather than entirely ‘new build’. 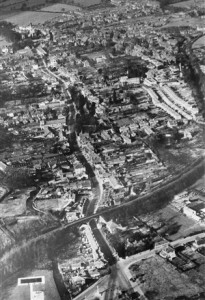 In July 1946 it was declared that Hemel Hempstead was to be designated a New Town and the population was to be increased from 20,000 to 60,000 people – an amazing change for a small market town to assimilate. The Order designating Hemel Hempstead as a New Town was made on 5 February 1947, and in March the Hemel Hempstead Development Committee was formally set up. The first plans were soon to be replaced by a new Master Plan. 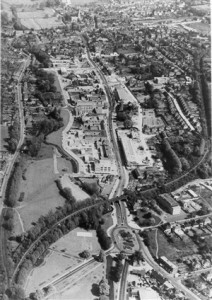 The main scheme was not simply to enlarge Hemel Hempstead, but to surround it with a series of neighbourhoods, each with its own identity and core facilities, including churches, shops and recreational facilities. The uncertainties brought a storm of opposition from local residents. The Hemel Hempstead Protection Association was re-invigorated to orchestrate part of the opposition. Farmers were concerned at the lost of 5,000 acres of land at a time of considerable food shortage. Large numbers of people were to be displaced from their homes in the Marlowes area alone. The New Town planners had the task of striking a balance between building houses, shops and factories at just the right pace. If the factories were not built fast enough, there was a risk that Hemel Hempstead would develop into a dormitory town. 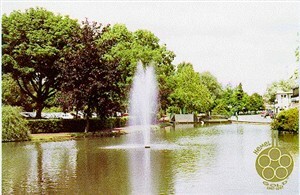 Gradually, a variety of light industries were attracted to the district. The first factory to be built was for Central Tool & Equipment, (Centac), of Richmond, a company which made milling machines. All the new industries came from London and brought with them a large number of their own employees, all of whom needed accommodation. The foundation stone for the first house was laid by the Mayor of Hemel Hempstead, Councillor Selden, on 23 April 1949. The first occupation was in February 1950, when the keys of four houses in Homefield Road were presented to bricklayers working on the estate. Many people had to travel from London to Hemel Hempstead to work every day because their houses had not yet been built. For some, the first time they saw Hemel Hempstead was when they arrived with the removal van. Early settlers had to contend with unmade roads and in wet weather everything was a sea of mud. Matching the availability of houses with services was not an easy task; for example, shops could not be opened until there were sufficient occupants to make them viable. People could trek into town, but most managed to buy their goods from the mobile shops, which regularly travelled round to the first settlements. The Development Corporation was very keen to create a community spirit and encouraged community associations and local newsletters, such as the Adeyfield Argus and Bennett’s End Bugle. The need for central meeting points was initially met by re-using the builders’ huts. Garages and sheds were used as temporary churches, often shared by people of different denominations. Gardening clubs were set up and competitions were started for the best front or rear garden in each neighbourhood. The New Town brought about immense changes. It altered the way people lived, worked and spent their leisure time. It brought different sorts of industries and trades to the town, as well as people from different backgrounds. It brought salvation for many people who had been forced to live in intolerable conditions in London and, one could argue, brought about a new vitality and new amenities to the town’s existing population.